I’ve just completed a Mansfield marathon. I attended the Victoria University, Katherine Mansfield Conference over the weekend. I liken my weekend to be part of an Elvis cult, except the weekend up at Victoria University was for fans of Katherine Mansfield. In fact, I found out there is a name for people like me – we are Mansfieldians. I’m not entirely sure that I’ve spelt that correctly, but you get my drift. And now I have to confess that this is not my first KM Conference. Three years ago, I attended the very first southern hemisphere KM conference in Melbourne. You would think that there I might have learned all that there was to know. But, this “brassy little shop girl of literature” (Frank O’Connor) manages to keep scholars and fans from all over the world coming up with new ways of reading, understanding and appreciating her life and her writing. Some people I met confessed to being at their third or fourth KM conference, so I’m really still a rookie. You do have to wonder, sometimes, mid-way through some exquisitely researched, minutely detailed, highly passionate and sometimes quite quirky angle on KM’s writing, what she would have thought about all of this... indeed, would she have approved, been flattered, or scoffed at the permutations, the belated posthumous attributions (about her motivations, her intentions, and meanings behind her written work)... the adulation. Highlights of the weekend for me were the perhaps less academic presentations (Sarah Laing gave us a glimpse of her planned Graphic Novel with early sketches and ideas and witty pertinent speech bubbles about the process of planning such a novel). Virginia King spoke to us about her Woman of Words sculpture made from pressed stainless steel which will be a towering figure in Midland Park draped in words – even KM’s famous fringe dripping words. I love it already and can’t wait to read Sarah’s novel and to see Virginia’s sculpture installed. Emily Perkins in one of the plenary sessions “Writers talk about Mansfield”, had the audacity to talk about the use of the word ‘little’ and how many times Mansfield uses this adjective and she experimented by replacing little with words like massive, to see how this might alter the text – needless to say her argument was circular (and intended to be), for indeed nothing Mansfield ever wrote was unintentional and little it seems is entirely what Mansfield intended. Thank goodness KM didn’t have a computer and an application for generating word clouds – imagine if she’d tried to edit out her over-use of little! Dougal McNeill, who teaches in the English programme at Victoria University spoke of the interesting absence in KM’s work of the all important social and political events of the time, such as the Russian Revolution, the First World War, and the First General Strike in the UK – that none of these political events entered her fiction – although her journals and letters record her reaction and response to these events. But too, in general throughout all the presentations, we were left with no doubt about her extraordinary achievement in the political sub-text of her modernist writing of woman, their sexuality and their relationships. None more than ‘Bliss’. The short story ‘Bliss’ was quoted many times, and delightfully in response to a plenary session, Harry Ricketts suggested a subliminal pun running through ‘Bliss’ – the idea of the pear (pair) tree, it’s possible flowerings (Bertha Young and Pearl Fulton, Bertha Young and her husband, Pearl Fulton and Bertha’s husband) – delicious! I could go on, as there were so many speakers, but many of the sessions ran parallel to others, so it was impossible to keep track of everything. Indeed, even if you had planned to move discreetly from one parallel session across to another, it was rather difficult. The timing of the speakers didn’t coincide accurately enough for you to sneak out of one session to another without perhaps causing offence to a speaker you were actually really enjoying, but you also wanted to hear the next speaker in another room. 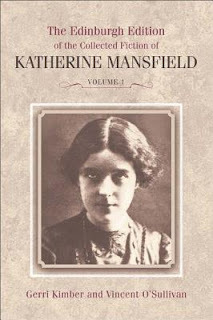 Of course, the highlight and focus has to be the launch of the ‘Edinburgh Edition of the Collected works of Katherine Mansfield’, two volumes, of KM works edited by Gerri Kimber and Vincent O’Sullivan and published by Edinburgh University Press. They retail for Eighty-five pound or around $NZ199 each – ouch – not cheap but I lust after owning them and I plan to write to Santa about it. There are two more volumes due out edited I think by Angela Smith and Gerri Kimber.... so the total collection would set you back somewhere around eight hundred dollars depending on the fluctuating pound to dollar conversion rate. Finally, last night there was a splendid dinner at Parliament hosted by Chris Finlayson and with guest literary stars, Dame Fiona Kidman and Witi Ihimaera who both read from their own work with an associated KM theme. Mansfieldians sipped wine, ate good food and mingled. Oh, you have to say, what a field day KM would have had, as a fly on the wall. And as for today, well when you mainline, you have to do your withdrawal gradually. Kevin Boon with his wife Margaret is running a morning and afternoon tour of KM haunts in Wellington City for conference attendees (especially those from overseas). I shall join the afternoon tour and visit the two historic houses and once more immerse myself in all things Mansfield. Which will be, quite enough, thank you for a while. Fiery Pacific Romance goes to the Cloud. James Patterson delivers again !